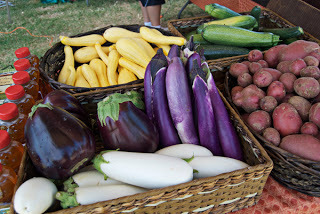 On Saturday, August 10, 2013 from 10 am till 1 pm the producers at the Henderson Farmers Market will celebrate the 2013 National Farmers Market Week with a variety of activities at their market. Each producer who is currently selling at the market will take time to set up a separate table with concession style foods available. A partial list for customers to purchase includes Pork BBQ Sandwiches, Fried Green Tomatoes, Corn on the Cob, Hot Dogs, Chilled Watermelon and Cantaloupe Slices, Water and Canned Drinks. There is also a Farm Animal Petting Zoo being planned. Other activities will include the 4-H Clubs Safety Kit Sale as well as possible demos by members of the market showing how to use their produce. All proceeds will be donated to the Henderson Farmers Market.